TE School District administrators and school board members are responding to the community on range of important topics tonight. At 6 PM in the Conestoga High School auditorium, the District residents have an opportunity to comment on the recent events involving the football team. My guess is that the administration will have little to say regarding the criminal charges filed against three senior players for their alleged assault of a freshman 14-yr. old student. Now a legal matter, the issue is in the hands of district attorney Tom Hogan and the courts. However, I would expect comment from the administration and school board regarding “No Gay Thursday”, the weekly hazing tradition in the locker room. The letter of March 17 from the District indicated hazing occurred. The implementation of a zero-tolerance hazing policy going forward is needed. The administration has conducted its own internal investigation and the community should expect an update on their findings. We know that Conestoga’s head football coach John Vogan resigned from his position and the other varsity and junior varsity football staff – five people – have been relieved of their coaching jobs in all sports through the fall season. The regular meeting of the school board follows the public meeting regarding the football team – 7:30 PM in Conestoga High School cafeteria. Priority discussion topics on the agenda include the Valley Forge Middle School fencing project, one:one computing initiative, and reapportionment plan. According to the agenda, the Valley Forge Middle School construction documents include options for 4 feet, 5 feet and 6 feet chain link fencing and 4 feet, 5 feet and 6 feet black estate fencing. According to the agenda, “The base bid will be per the recommendation of the safety and security consultant of a 6 foot chain link fence with the other options being bid as alternatives”. The $15,500 consultant’s report recommended a minimum of 5 feet fencing (and 6 feet fencing preferred), so why is 4 feet a consideration? I thought the public was told that 4 feet fencing does not meet school security standards. 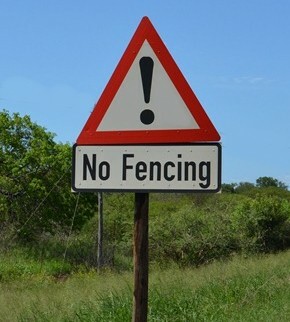 But more importantly, … where’s the ‘no fencing’ option? “To fence or not to fence” was at Valley Forge Middle School was a major campaign issue in the November TE School Board elections. Several candidates, now school board directors, used ‘no fencing’ as part of their campaign platform. In District 2, school board directors Michelle Burger and Ed Sweeney, were both extremely vocal in their fencing opposition; promising voters they would not support additional fencing at VFMS. By some accounts, former school board president Kris Graham lost her bid for re-election over the VFMS issue and her support for the fencing. Tonight it looks like the fencing project may finally be coming to a head and it will be interesting to see how each school board member votes. A vote for no fencing remains an option. On the plan to outfit students with District computers, not everyone in the community shares the administrations’ interest in the student computer initiative — for a variety of reasons, product choice, leasing vs purchase, privacy issues, costs, etc. Has the proposed one:one computing initiative been thoroughly vetted? The taxpayers are facing a significant tax increase for 2016-17, is the school board satisfied that they should move forward to implement this computer plan? A reminder that in January, the school board unanimously adopted the 2016-17 preliminary budget, which contains a 4.3% tax increase. At that time, the Board decided to “keep their options open” by approving a preliminary budget with the Act 1 index of 2.4% and allowable exceptions to Act 1 of 1.9% to close the project budget deficit of $4.75 million. If the 2016-17 budget passes with a tax increase, it will mark the 12th straight year of a tax increase. Some of the school board members publicly voiced concern over the proposed tax increase, vowing to work to lower the increase in the final budget. The Valley Forge Middle School fencing debate continues … And now the local Tredyffrin Republican Committee has joined the mix! The Tredyffrin Township Republican Committee is taking a formal position opposing the proposed fencing next to Valley Forge Middle School, along Valley Forge Road. In addition to serving as chair of the Tredyffrin Republicans, attorney Neill Kling is chair of Tredyffrin Township’s Zoning Hearing Board and was a candidate in the last school board race. At last night’s TTRC meeting, Kling proposed the motion to oppose the 5-6 ft. fencing at Valley Forge Middle School on Valley Forge Road – the resolution passed. I view this vote and opposition to the fences as reflective of the will of Tredyffrin’s citizens and it is certainly the will of many Tredyffrin Republicans as well as many of my Region 2 constituents. There are various reasons for opposition, including it does not add significantly to safety and has nothing to do with violent attacks, the cost, and it will injure the appearance of the neighborhood on what for all practical purposes if a front yard in a gateway to the historic Valley Forge Park. The rationale appears as explained by the consultant to be to mainly prevent the deer coming on the property and to prevent “runners” from leaving along Valley Forge Road. These rationales are weak. Historically, neither issue has been a big one and the local police chose not to weigh in on the expert’s report. I find the report subject to severe criticism because of its tone and attack on the numerous people who gave input. An ad hominem attack is not a good example for our children on how to professionally analyze and support an issue. Sweeney is the only currently serving Republican school board director from Tredyffrin Township. Will the actions of the local Republican Committee have any bearing on the outcome of the fencing project? And what about the Tredyffrin Township Democratic Committee … will they now feel any pressure to follow the actions of the local Republicans with a public statement of opposition. The Democrats hold a majority on the school board and all five are from Tredyffrin Township (Kevin Buraks, Scott Dorsey, Michele Burger, Roberta Hotinski and Todd Kantorczyk). Kudos go to Ed Sweeney for taking a public stand on the Valley Forge fencing issue as an elected official. In the past, there has been much control (or at least perceived control) placed on the use of social media by school board members. Regardless of what happens on the fencing issue, I’m glad to see that at least one member of the Board is breaking with tradition! The Valley Forge Middle School fencing project and the safety consultant’s report will be discussed at the upcoming Facilities Committee meeting, Thursday, Feb. 18, 5 PM. The recommendation from the Facilities Committee could determine the future of the fencing project. The TE School District saga of the fencing project at Valley Forge Middle School continues. We learned on Thursday, through the District’s website, that the “Final Report on Fencing at Valley Forge Middle School’ was available to the public. Or so we thought. In September 2015, the District contracted with Ken Trump and his firm, National School Safety and Security Services to conduct a school safety assessment to evaluate fencing at VFMS. A 3-day site visit was conducted on November 18-20. On the final day of their site visit, Trump and his associate Charles Hibbert presented their preliminary findings at a District Facilities Committee meeting. The long-awaited final report, dated January 8, 2016, was reviewed by the school board and administration and then uploaded to the District’s website on Thursday, January 28. More about the final report in a minute but first, I need to explain that the consultant’s report mysteriously “disappeared without a trace” from the District’s website yesterday (Saturday) and then mysteriously “reappeared” late today without explanation. Word has it that there was some kind of computer glitch. Interesting. Much contained in the final VFMS fencing report was expected and very similar to the presentation by Trump at the Facilities Committee meeting in November. Although hired to evaluate the fencing at VFMS, sadly the report also contains an unnecessary and offensive tone in regards to the community. The report includes a negative critique of residents and their viewpoints and, in my opinion, comes across sounding very unprofessional. In describing the input from community members, Trump stated, “We found their opinions to be entrenched, their objectivity skewed, and the attacks by some of these individuals upon the consultants’ recommendations and intellect to be disingenuous.” The report suggests that resident’s opposition to fencing had to do with “furthering entrenched personal and power struggles with select district board members and the administrators. “ Wow. Bottom line is that Trump recommends fencing at Valley Forge Middle School. According to the report, the fencing at VFMS provides “risk reduction benefits” which will ‘mark’ the school boundaries and deter deer, fox and dogs! The report recommends five foot minimum (six foot preferred) chain link fencing to enclose the upper field and track. Along Valley Forge Road (Rt. 252), the consultant recommends five foot minimum (six foot preferred) chain link fencing. It should be pointed out that a variance would be required by Tredyffrin Township’s Zoning Hearing Board as the recommendation exceeds the height restriction of fences. Trump closed his report by stating that the “community convenience, as well as community individual or group specials interests, cannot continue to drag out what is an already over-extended process …” A rather judgmental comment by the consultant on the community and remember that we paid $15,500 for this report. So what’s the next step? At the January Facilities Meeting, chair Virginia Lastner stated that the consultant’s fencing report would be discussed at the next meeting on Thursday, February 18, 5 PM at the Administration Building. A full school board discussion with the public should happen at the regular school board meeting on Monday, February 22, 7:30 PM at the high school. For the sake of transparency and public involvement, the VFMS fencing project deserves a place on the agenda at the regular school board meeting on February 22. Before the school board makes a decision in this matter, all options or possible compromises need to be fully vetted in front of the public. Presumably the vote on fencing at VFMS will take place at the March 28 school board meeting. School fencing is important school safety issue to TE School Board — Why not same level of safety concern for 5th grader? During one of the two comment periods of the TE School Board meeting on September 21, District residents Mr. and Mrs. John Alexander asked the school board directors for assistance with a busing situation pertaining to their son Jackson. The Alexander’s, who live on Valley Forge Mountain, had previously attempted resolution through email and phone calls to the District but were unsuccessful. After their passionate appeal at the school board meeting, the District’s business manager Art McDonnell intervened to say that this was a bus schedule matter and any school bus policy changes need to go to the Policy Committee the following month. The Board concurred with no further discussion. Our son, Jackson, is taking a school district shuttle bus from VFMS to VFES to ride the elementary school bus home two days a week, so that he can participate in 5th grade band and chorus as after school extracurricular activities since both my wife and I work outside of the home. 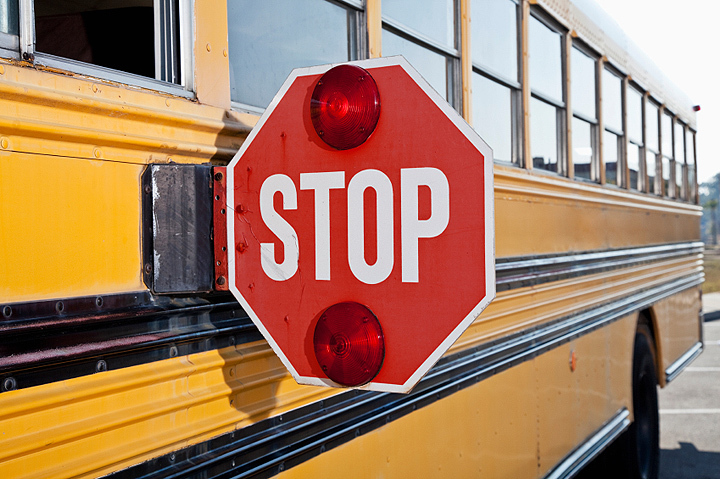 The problem is that even though the elementary school bus passes right by our house twice on its route, the school district’s procedure is to only stop at the closest current elementary school stops. This means that Jackson has to get off almost a half a mile away at the nearest established elementary school stop and walk back to our house which unnecessarily increases his risk of being hurt or otherwise harmed, especially since there are no sidewalks on Valley Forge Mountain. We had hoped that a simple phone call and/or e-mail requesting the bus to let him off at his old elementary school bus stop from last year would settle the issue and be a Win-Win situation since there would be less risk of danger to our son and the School District wins because there is less risk of an incident for which they would be liable while not impacting other students & families in any material way. Our bottom line – It seems like the school district is more concerned with minimizing disruptions in their bureaucratic process & procedures rather than taking simple & reasonable steps to increase the safety of a child in returning to their home from school. Shouldn’t student safety be paramount and outweigh bureaucratic processes when reasonable alternatives exist? Now, we are faced with waiting for the Policy Committee to review this in the middle of next month with no guarantee of a favorable decision/ruling. Over the last couple of years, the school board has focused much attention on school safety, including trying to convince residents that ‘fencing schools’ is the answer to keeping our children safe. Yet, here we have a 10 year old boy walking ½ mile from the school bus on Valley Forge Mountain to his home, after the bus passes his house twice on the route. Beyond the obvious safety aspects of this situation, where is the open communication between the Board and this TE School District family. Jackson is the youngest of the Alexander’s four children, so the parents fully understand how the school district works and are not seeking preferential treatment. According to John Alexander, he had previously inquired about the existing “bus policy” cited by Art McDonnell; however, it was not provided. Rather than showing leadership and finding a reasonable solution, the school board accepted the business manager’s approach to “kick the can” to the Policy Committee meeting next month. The Alexander’s have to wait a month to take their reasonable request (and simple solution) to the Policy Committee. To be clear, the Policy Committee can only hear the policy request and make recommendations. At best, the Alexander’s will have to wait until the next school board meeting for full board discussion. However, most policy changes, take more than one Policy Committee for recommendations so who knows how long this “simple family request” will take for resolution? I do not understand “why” all school district roads seem to lead to Art McDonnell, the business manager. Beyond the expected business/financial related aspects of his job description, McDonnell is the keeper of the gate for the District’s communications and the Board’s emails from residents, the Public Information officer and the Right-to-Know request recipient. We learned at the last school board meeting that McDonnell ‘hand-picked’ the school safety consultant (without issuing an RFP) and now we find that apparently he is in charge of the District’s bus schedule! I have sat through many regular and committee meetings of the District and have witnessed an alarming trend…many of the Board’s discussions/decisions seem to defer to Art McDonnell! In my opinion, the decision making powers of Art McDonnell seems to extend well beyond the normal and expected business manager boundaries. As of July 1, the District hired a new Superintendent; so where’s Dr. Gusick’s voice on these issues? As residents, we didn’t elect Art McDonnell to govern the District – we elected the School Board. Plan to support those school board candidates in the upcoming election on November 3rd who will do their homework and govern with independent thought! We need effective leadership! What’s that proverb about a “bad penny always coming back”? After last week’s TE School Board meeting, that could be a fair description of the Valley Forge Middle School fencing project. Residents who attended the District’s June 12th Facilities Meeting expected the fencing discussion at Valley Forge Middle School to finally end. But instead, the public learned that after many, many meetings and months of legal bills for the District (i.e. taxpayers), the Chesterbrook Civic Association and Green Hills homeowners, Board President Kris Graham’s proposed hiring a safety consultant for the Valley Forge Middle School. The Board has repeatedly cited the 2013 safety report by Andy Chambers (the former Tredyffrin Township Police Chief) as the rationale for building fences around the District’s eight schools. However the public was not provided input for the safety study and the Board, citing safety reasons, never permitted the public to see the report. Although District residents have not read the Chambers’ safety report, the Board claimed that its safety suggestions included fencing all schools. Taxpayers paid (“not to exceed $11,500”) for the safety report two years ago, so did the Board decide to spend more money on another study (to focus specifically on VFMS). During the Facilities Committee meeting the Board was quick to point out that the District would send out a RFP for the VFMS safety consultant, which they admit was not done before they hired Chambers in 2013. The Facilities Committee met Friday, June 12 at the district offices on West Valley Road and the meeting was open to the public. We discussed again the possible installation of additional fencing at Valley Forge Middle School. The committee has decided after many meetings of which this issue was discussed to obtain a second opinion from an additional safety consultant who will review the Valley Forge Middle School site specifically and make recommendations as to whether or not additional fencing at the site is advisable and if so what it should look like and where it should be placed. The process will be an RFP will go out this summer for a school safety consultant. The selection of the safety consultant will begin at the next committee meeting in public with public input. I want to clarify that this means no new fencing will be installed at Valley Forge Middle School this summer. Initially the hiring of the safety consultant appeared as part of the school board’s consent agenda but was later removed to allow for discussion. Contrary to what the Board previously stated on at the Facilities Committee meeting on June 12 and at the June 15 School Board meeting, no RFP was released. The Business manager Art McDonnell contacted three safety security companies and asked them for a proposal. McDonnell ‘picked’ the company, National School Safety & Security Service at a cost of $15,500. No District signed contract for National School Safety’s services. Responding to Board and resident questions, McDonnell suggested that a contract was not necessary and pointed to the company’s proposal on the TESD website. (The proposal is found on pg. 177 of the Sept. 21 school board agenda}. Residents asked the cost of the other 2 safety security companies. McDonnell did not have the exact figures but thought one was around $4,000 and the other $20K. National School Safety’s proposal contains no dates for the deliverables. Their consulting fee of $15,500 is for pre-visit phone calls and review of existing documents, 3 day visit which includes 1-1/2 days of interviews and site visits, 1/2 day of debriefing and presentation to committee and written report of recommendations. No public meeting on this topic is included in the company’s proposal. When pressed on the need for the safety consultant to receive public input on fencing, etc., McDonnell referenced a proposed public meeting for Thursday, Nov. 19 with a preliminary safety report from the consultant to be given on Friday, Nov. 20 at the 2 PM Facilities Committee meeting. What is the value of resident input if the public meeting is held less than 24 hrs. before National School Safety delivers their preliminary report at the Facilities Committee meeting. Several residents and Board members questioned McDonnell regarding the ‘scope’ of the consultant’s work without the benefit of an RFP. How would the company know the District’s expectations? 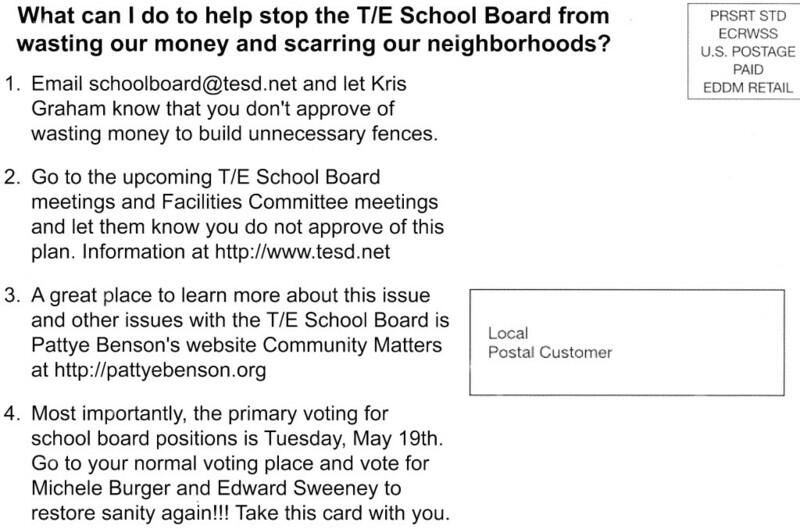 In the end, the Board offered that residents could send emails about the fencing project to schoolboard@tesd.net and they would forward to the safety consultant. For the record, Art McDonnell is the public information person and all emails to the school board must go through him first. I have attended many school board and committee meetings but the discussion to hire a safety consultant for Valley Forge Middle School had to be one of the most troubling I have ever witnessed. The decision to hire the safety consultant lacked process …there was no RFP outlining the District’s expectations as the Board previously stated – no dates for deliverables – no contract – no resident input provision, etc. Even with all the questions and uncertainty the Valley Forge Middle School security consultant, the Board voted 9-0 to hire National School Safety & Security Services at a cost of $15,500. Where’s the P.R.O.C.E.S.S.? The public is repeatedly told that the ‘real work’ goes on at committee meetings. Really? Last night’s TE School Board meeting did not mark a good night for the District’s taxpayers! Many of us left the meeting disheartened and feeling like the warm summer evening would have been better spent with a glass of Chardonnay. Here are the highlights, or rather low-lights of the meeting. The District’s Business Manager Art McDonnell and the architect Tom Daley from Daley & Jalboot presented a lengthy presentation on the proposed $4.5 million maintenance & storage building. Helping to convince that the project was necessary, photos of current overcrowded storage facilities, closets, etc. accompanied the presentation. Taxpayers did not question that something needed to be done to improve the situation but did question the project’s escalating costs, the Old Lancaster Road location and the treatment of the neighbors. The fantasy architectural drawings indicate a tree-lined boulevard, not the realty of Old Lancaster Road … a narrow residential street of small homes sitting below grade to this new, large maintenance building. 2015-16 Budget: Approved deficit budget with a 3.81% tax increase, 8-1 (Liz Mercogliano dissenting vote). The 3.81% tax increase marks the eleventh straight year that the TE School Board has raised taxes. According to the Philadelphia Inquirer from Sunday, June 14, the 3.81% tax increase for 2015-16 marks the largest tax increase in Chester County. Valley Forge Middle School Fencing: Board agreed to further discussion of hiring of a fencing safety consultant at the next Facilities Committee meeting. An RFP for safety expert to be sent in the Fall. TE School District Redistricting: Based on the distribution of voters in the school district, there is under representation of elected officials in Tredyffrin, District 2. It was suggested that the Board’s Legislative Committee would review the redistricting issue at their next meeting, in September. Disenfranchised voters are discussing a grassroots effort of their own re redistricting. Reflecting on last night’s school board meeting, had me wondering why should I or other citizens bother to show up? As some have often stated on Community Matters, the Board seemingly makes its decisions in advance and then delivers those decisions as a united front. Questions from the public are only marginally answered, if at all. The Board views comments from residents as criticism and/or annoyances. Election Day is November 3, 2015. 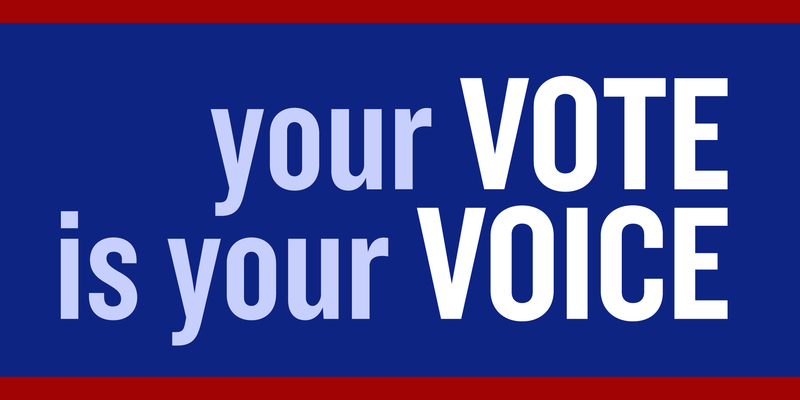 Five seats on the TE School Board are on the November ballot – Vote for Change! Question: To fence or not to fence at Valley Forge Middle School? Answer: No for Election Year, but 2016 is another story! After months and months of legal bills on the District’s side (i.e. taxpayers) and on the part of the Chesterbrook Civic Association and Green Hills residents, the Board has decided the District needs another school safety study, which will focus on fencing at VFMS, before they can make a decision. 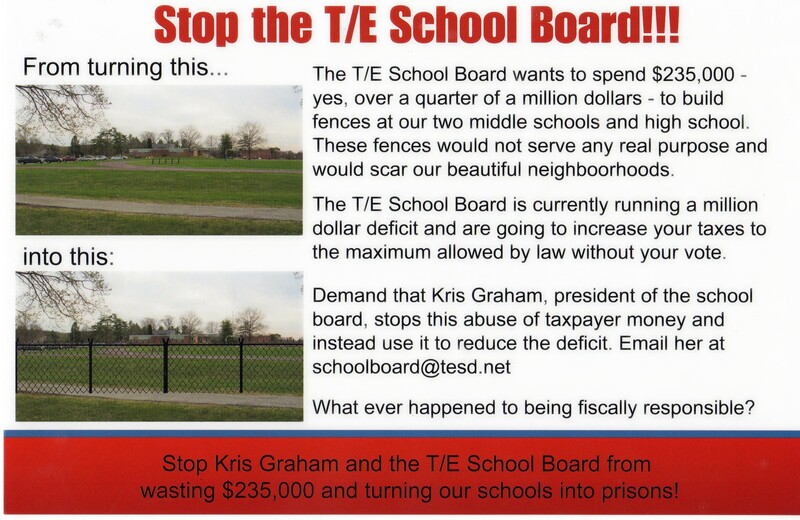 After TESD President Kris Graham read her statement proposing the hiring of a safety consultant for the Valley Forge Middle School fencing project, other Board members embraced the suggestion. What? As background regarding the school safety study – In January 2013, the District hired Andy Chambers (the former Tredyffrin Township Police Chief) as the safety consultant to review the safety of the eight schools. Initially Chambers’ hiring was included on a school board consent agenda. Facing claims of Sunshine Act violation, the District solicitor Ken Roos recommended the ‘reconsideration’ of Chambers at the following Board meeting. Ultimately, Chambers was hired with a 7-2 vote with former school board members Anne Crowley and Rich Brake citing ‘lack of transparency’ in their dissenting votes. The public was told that Chambers contract was ‘not to exceed’ $11,500. The Board has repeatedly cited the safety report as the rationale for building fences around the schools – it certainly provided the basis for why the five elementary schools were fenced last summer. The public was not provided input for the safety study and we were not permitted to see the safety study when completed (the Board cited safety reasons). The District has denied right-to-know requests for the study. The taxpayers paid for the District’s safety study two years ago, which claims to suggest that all District schools need to be fenced. Why is the 2013 safety study not applicable for VFMS? Now many, many meetings and legal and architectural fees later, the Board has decided that the District needs to spend more money for a new safety study – this study to focus specifically on Valley Forge Middle School fencing. It should be noted that the Board was quick to mention that this time the District will send out an RFP to find a safety consultant (something they admit was not done before they hired Chambers). I’m sorry but I just don’t understand. Why is the District going to spend more money on the VFMS fencing project by hiring another safety consultant? The uncertainty for the neighbors continues, as the Board was quick to say that when this new study comes out in early 2016, it may still require fencing VFMS. Here’s a question for the Board — why not have Police Superintendent Anthony Giaimo and the Tredyffrin police conduct the safety study for the District? Certainly Giaimo’s background and experience would make him an excellent choice to review school safety. Three school board candidates attended the Facilities Meeting (Fran Reardon, Easttown, Region 3 and Tredyffrin West, Region 2 candidates Michele Burger and Ed Sweeney). For the two open school board seats in Tredyffrin West, Region 2, the Primary election results had Burger (D) and Sweeney (R) receiving the highest number of votes respectfully – with TESD Board President Kris Graham in third place. There’s little doubt that the ongoing VFMS fencing issues cost Graham votes. I wonder if she thinks that by spending taxpayer dollars for another safety study and delaying the fencing project until 2016, will translate to a higher vote count in November. The proposed middle school and high school fencing project and the mega-million dollar Maintenance Building are two of the agenda items for the District’s Facilities Meeting tomorrow, Friday, June 12 at 12 Noon. The school fencing project, specifically at Valley Forge Middle School, has seen a lot of attention in recent months. The school property abuts the property of some of the Green Hills properties in Chesterbrook. and initially the plan had the fencing going directly behind the Green Hills homes. It now appears that the District has agreed to move the proposed fencing away from the homeowner’s back doors but unanswered questions remain. Discussion (debate?) continues on the placement of the interior fencing, the height of the fence (4 ft, 5 ft. or 6 ft.), the type of fencing material, signage, etc. The five District elementary schools received chain link fencing but the Chesterbrook residents are asking for a material upgrade to white vinyl fencing to match existing fencing in the planned community. There appears to be an agreement that any upgrade materials fee from chain link to white vinyl will be split between Chesterbrook residents and the District’s taxpayers. The white vinyl fencing is to run along the side of VFMS property on Valley Forge Road (Rt. 252). This upgrade fencing option would only ‘mark’ the District’s property and cannot be viewed as a safety feature. The construction start date for school fencing at Valley Forge Middle, TE Middle and Conestoga is June 24 with a scheduled completion date of August 14. Since there is a change order for the originally approved fencing at VFMS, the Facilities Committee will need to decide the next step – will it need to go back to the full Board on Monday, June 15? Although the District has been unwilling to publically state how many residents have contacted the Board regarding the proposed fencing – I know that the number continues to rise. Many residents have copied me on their correspondence with the District and then complained when they have received no response. To be clear, there may be residents who support the fencing project, but I have personally not received copies of any such correspondence. Below is a copy of a recent email to the school board from Mr. Gary Wolf, a Chesterbrook resident. This email is included below with his approval. Our tax dollars are irresponsibly and continually misused by the T/E School Board. One of my choices to address this concern, besides moving out of our Tredyffrin home that my wife and I have lived in for 27 years, was to exercise my right to vote … which I did. I chose not to vote for Kris Graham on May 19th. While my vote is only one in many, I’m fed up with our taxes being increased and our school board acting as though this district is a “money pit.” Specifically, we don’t need fences at our schools to the tune of almost a quarter million dollars. My wife worked at VFES for 19 years, and saw the waste and misdirected funding of the T/E administration. For example, the kids had a paltry allocation of $1.00/year/student for their first aid care while the principal bought new office furniture essentially every year, applying the “use or lose his budget” mentality. If I managed my department for my employer in that manner, I’d be out of work. And … we continue to pay for Dan Waters’ amenities and life style that even us reasonably blessed professionals will never realize. Spend it on the kids!! Enough is enough! Another of the major discussion items on the agenda is agenda items is the new Maintenance & Storage Building. As we learned at Monday’s Finance Committee meeting, the bids for this project were due in this week on June 9. The project bid will not include any of the costs leading up to this point – the legal and architectural fees, traffic studies, township permits, eco soil testing, etc. When the Business Manager was asked about a total of those pre-construction costs, Art McDonnell stated that he would provide a total of those costs as well as the construction bid costs at the Facilities Meeting. At this point, the District has already invested a lot of money on the maintenance building project. Because this project has greatly exceeded initial estimates, it would be fiscally responsible for the Board to thoroughly analyze the costs, and review all available options, before granting final approval. According to the District, the construction start date for the maintenance building is August 17, 2015 with a scheduled completion date of June 29, 2016. Regarding this week’s Finance Meeting, the proposed tax increase has now edged up to 3.81% for the 2015-16 school year. Should this tax increase be approved, it will mark the eleventh year in a row that residents have seen their taxes go up — you would have to go back a decade to 2004-05 to find the last time that there was no real estate tax increase. Is this really the best time to spend $4-5 million for a maintenance & storage building? There were a number of school board candidates at the Finance Meeting, it would be interesting to know their thoughts about the proposed budget. There was a brief mention about the District’s food service budget and something about a $400K loss but … that the department really didn’t have a loss but actually had a profit! I have no idea what this is about — is the District practicing a form of ‘new math’? Perhaps my friend Ray Clarke can enlighten us! Update: Neal Colligan sent the following email to the T/E School Board Thursday evening regarding the District’s proposed Maintenance & Storage Building and provided a copy for posting on Community Matters. Apologizes for not being able to join you at the Facilities Meeting tomorrow. I did want to take this opportunity to give you some thoughts on your maintenance building that you will be discussing tomorrow. Much has been said on that project and I see know need to go into its history… You’ll already have reviews all that. The choice you may make tomorrow is to recommend a contract for the construction of this 14,000 SF facility that has been in the planning stage for so long. At the last Facilities meeting, the revised estimate for the construction of the building is almost $4 MM. After you add the cost of land acquisition, planning and architects, legal, and other sunk costs… This facility could well coat almost $5 MM. On a price per square foot basis, this gets pretty close to $300/SF. I work financing commercial real estate and I’d like to share some insights. In a commercial loan scenario, a lender would give you only a portion of the value of a piece of real estate (typically 65-75%). This discipline is adhered to for obvious reasons..,. The lender would like to get paid back. If they don’t get paid back frontmen owner, they’d like to see their way to get their money back through taking the real estate back and selling it. Why is the germane? You’re a not for profit building for your own needs. Here’s why the above is important: you are borrower inc the money. Further you’re borrowing it on the back of the taxpayers. You just completed a large bond offering. You have a AAA rating based primarily on the ability of the citizens of our community to pay taxes. Indeed, WE; the taxpayer, are the security for this loan. As THE security for your bond issue, I would appreciate it if you would apply the same discipline that you would see from a normal commercial real estate deal. If you had that building appraised… You would find out it’s worth about $1 MM. Don’t believe that? Find out…have it appraised OR ask Tripp Lukens on the Planning Board…. He’s a commercial appraiser and would be happy to speak on value, likely for no charge. At least investigate it…please don’t pay 4x value for a non-strategic asset (one where no learning takes place). I know you’ve spent considerable time on THIS plan but now it’s costs have far out-stripped it’s utility/value….my opinion. And my opinion should matter; I guaranteed the bond issue by being a citizen of this community. You should not pay anywhere near the amounts recently released by Facility for this asset. There ARE other alternatives….lease/buy an older building/etc. At $4-$5 MM of money borrowed on the credit of this community; you must go look at new alternatives. Thank you-and I apologize for any miss-spellings; writing on my handheld without glasses. Questions continue regarding VF Middle School fencing — still no resolution! 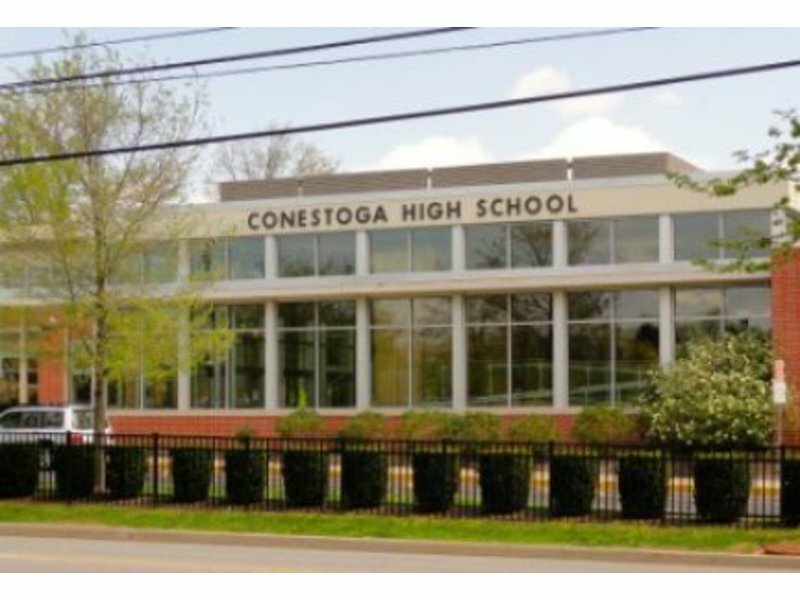 The TE School Board approved the 2015 graduating class of Conestoga HS at Wednesday, May 27 school board meeting. Commencement will take place on June 2, 7 PM at Villanova University. First, I would like to say congratulations to the class of 2015. This school board has heard from many residents both in person an in email about the proposed fencing project. Not one person has spoken out in support of the fencing project. How can the school board continue to hear from the residents in person, in email, and in the voting booths and continue to be deaf to them? My second question is how many emails have you received so far from residents in the past couple of weeks asking you to stop the fencing project. The residents in TE Region 2 are really starting to get upset with the under representation that we have on this school board. TE Region 2 has almost as many people living in it as TE Regions 1 and 3 combined. That means that we have half the representation per person. Perhaps this is why you feel that you can keep shoving this fence project down the throats of the parents of students and residents who live here. This situation feels like TE Region 1 and 3 coming in like a bunch of carpetbaggers and ignoring the opinions of the people in TE Region 2. How many more residents do you need to hear from before you halt the current fencing plan and reconsider the scope and placement of proposed fences, this time with actual community input? I will conclude with the same request that I made at the last school board meeting. I would really like for someone on the board to please make a motion to table the fencing project for further cost benefit analysis and someone else second that motion. While you are at it, it would be likewise helpful to have someone make a motion to table the new facilities building until a cost benefit analysis is done. That is another project where the school board needs to step in and give guidance as it is running way over the original budget. For the record, Doug Anestad reports that not one Board member answered any of his questions. Why doesn’t the Board respond to resident questions? For example, all emails addressed to the school board filter through the Public Information Officer Art McDonnell, who then in turn forward them to the individual Board members. There is no question that residents have contacted the Board with their opposition to school fencing and the use of taxpayer money for fencing. I have heard from several residents who tell me that they have sent emails regarding the fencing but received no response from the District. Resident’s emails to the Board are private but there is no reason that the ‘number’ of emails received on an issue is not public. Not every resident question should require him or her to file a right-to-know with the District to receive an answer! Doug Anestad is the frustrated District taxpayer who mailed (at his expense) an anti-school fencing postcard (below) to all residents residing in TE School District Region 2. Timed to arrive days before Primary Election Day, Doug suggested that voters support Michele Burger (D) and Ed Sweeney (R) versus incumbent school board president Kris Graham (R) for the two Board openings. No one can say if it was the power of Anestad’s campaign strategy or simply coincidental but the election results had Burger and Sweeney receiving the highest number of votes with Graham in third place. Anestad is representative of a growing concern on a number of issues, including the District’s use of taxpayer dollars for fencing projects and an overpriced maintenance building while continuing to raise taxes. The overall lack of public input and communication between the Board and the residents seems to be the core of the problem. Regarding the VF Middle School fence project, residents have received mixed messages from Board members resulting in a ‘he said-she said’ conflict rather than resolution. If the debate continues over District spending on fencing and the multi-million dollar maintenance building, the November election results may not be what School Board President Kris Graham wants. Discussion regarding the school fencing project and the District’s $4 million++ maintenance (“Taj Mahal”) building will continue at the Friday, June 12 Facilities Committee meeting. It is my understanding that if the committee does not reach consensus, the issues go to the full Board on Monday, June 15.